Michelle Obama looked out of place as she made a “surprise” appearance at last night’s 2019 Grammy Awards. 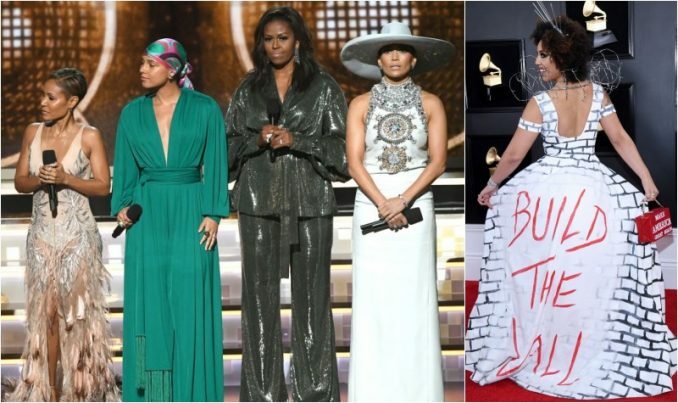 But that was nothing compared to singer Joy Villa’s “Build the Wall” dress that gladly welcomed the former first lady and the rest of the Hollywood haters on the red carpet. You’ll love this. Michelle Obama made a surprise appearance at the 2019 Grammy Awards. Even though most Americans decided not to watch the music awards, one has to wonder why the former first lady was on stage with Lady Gaga, Jenifer Lopez, Jada Pinkett Smith, and Alicia Keyes. Did we miss Michelle’s new album? No, last time we checked she was on her international tour selling her book. So, why is she on the Grammys? Well, simply because she claims her life is all about Motown. Of course, the far-left Hollywood crowd loved it when she showed up. “Music shows us that all of it matters, every story within every voice, every note within every song — is that right ladies?” Obama asked, looking around at the women on stage with her. It was truly cringe-worthy. Michelle Obama isn’t in the music industry, but she sure loves to pretend she is now a big star. Well, enter Joy Villa who has been the thorn in the side of the Hollywood crowd on the red carpet. This year, she really went there and wore a “Build the Wall” dress that no one could miss. Most people remember Villa for the “Make America Great Again” dress she wore back in 2017. The pro-Trump musician showed up on the red carpet sporting a black-and-white gown with a brick motif inspired by Pink Floyd’s 1979 album The Wall with the words “Build the Wall” on the back side. The dress — designed by L.A.-based Desi Lee Allinger-Nelson of Desi Designs Couture, Villa told The Hollywood Reporter — also featured barbed wire on the shoulders to mimic the top of a security fence, a spiky headpiece, and a silver cloak-like dress over that top that alludes to steel. Her red purse sports the words “Make America Great Again” and was also custom-made by Allinger-Nelson as a riff on the Trump MAGA hat. There’s no doubt Joy Villa made a splash that caused quite a commotion at the Grammys. And we bet Michelle Obama didn’t like the pro-Trump publicity Villa was inspiring out on the red carpet. 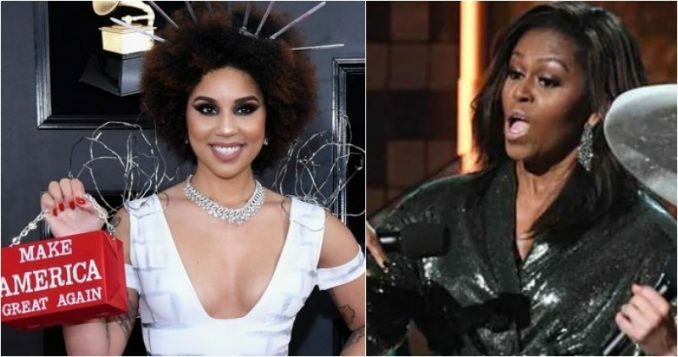 Even if she didn’t know Michelle would be there, Joy Villa had the perfect welcome ready for the former first lady.